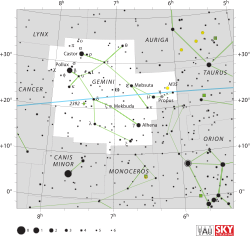 Tau Geminorum, Latinized from τ Geminorum, is a star in the northern zodiac constellation of Gemini. It has the apparent visual magnitude of +4.42, making it visible to the naked eye under suitably good seeing conditions. This star is close enough to the Earth that its distance can be measured using the parallax technique, which yields a value of roughly 321 light-years (98 parsecs). It is an evolved giant star of the spectral type K2 III. It has double the mass of the Sun and has expanded to 27 times the Sun's radius. Tau Geminorum is radiating 224 as much radiation as the Sun from its expanded outer atmosphere at an effective temperature of 4,528 K, giving it the characteristic orange-hued glow of a K-type star. It appears to be rotating slowly with a projected rotational velocity of 5.8 km s−1. This star has a brown dwarf companion Tau Geminorum b, whose mass is 18.1 Jupiter masses, and which was discovered in 2004 by Mitchell et al., who also discovered Nu Ophiuchi b at the same time. This brown dwarf takes 305 days or 0.84 years or 26.4 megaseconds to revolve around Tau Gem.